Applicable to both hooks and swivel shackles, the anti-rotation device locks the fitting in the fixed position desired. 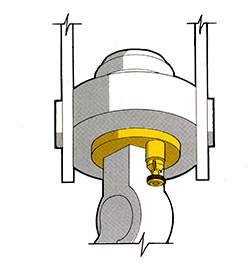 Two types of these swivel locks are offered: a screw type, which is hand-turned directly into the hook nut (4 position); and a spring-loaded plunger type which snaps into the bottom of the hook housing (8 position). Shorty “J” anti-rotation devices are available on new blocks or on blocks which have been returned to the plant for retrofit. ON PREVIOUSLY PURCHASED BLOCKS – Indicate Block Model Number and Serial Number.